Danang, a potential and promised land which is considered the capital economic and tourist of ceneter region with commercial seaport and airport. Danang is favored by nature situated in middle point of the four well –known World Cultural Heritages including Hue ancient capital, Hoi An ancient town, My Son Holy Land, Phong Nha – Ke Bang. Danang also has lots of attractive spots as Hai Van pass, Non Nuoc, Son Tra, Tien Sa, Ba Na,etc which tourists feel unforgottable after visiting the city. Located in the center heart of dynamic and full of vitality city, Hoang Anh Plaza Hotel Danang with 23 floors is the tallest plaza hotel in Danang. Hoang Anh Plaza Hotel Danang is an international 5-star hotel, 1.5km from International Airport, neighboring on the center of the business, shopping, markets and entertainments. 180 room including superior, deluxe and president large space, luxury and mordern facilities. 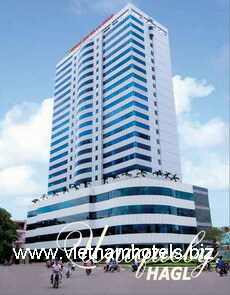 Hoang Anh Plaza Hotel Da Nang has 02 conference rooms. One conference room accommodating up to 500 persons with full range audio - visual and meeting equipment. This is ideal place for conventions, banquet and siminars. Sea & Mountain offer vietnamese, cuisine as well as chinese. Coffe bar in 23rd floor : from the hightest place of da dang city, the wave of clounds in Ngu hanh Son, the beautiful streets by han rives and the ship in the Tien Sa Harbor. Live music night club, karaoke. Lucky Gaming Club for foreigners and Oversea Vietnamese .